Pavlova is a meringue-based dessert with a crisp crust and soft, light inside, filled with fruits, cream or whipped cream. The dessert is believed to have been created in honor of the Russian ballet dancer Anna Pavlova who visited Australia and New Zealand in the 1920s. 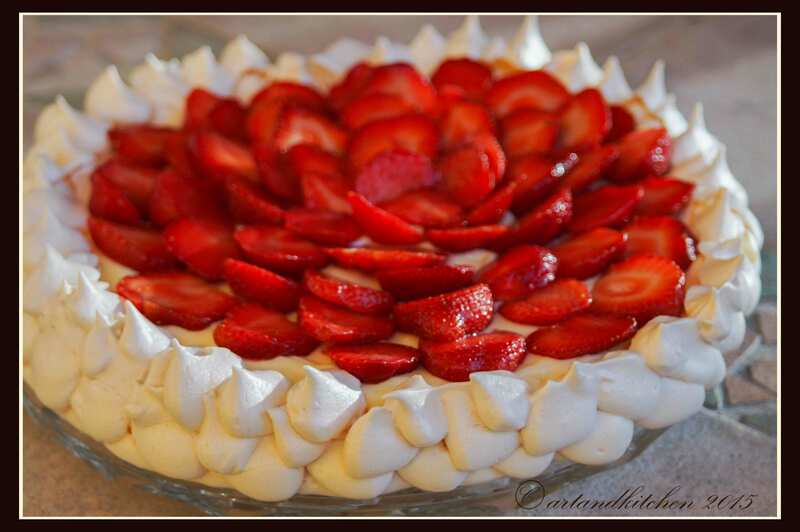 Years ago a friend told me about this wonderful dessert, I never had seen it before and the first time I prepared this dessert I had to fight with my fear of making meringues. I had to learn how to make them and I began to read recipes in books and in the internet. As soon as I understood that this is really not difficult I decided to try it and I wrote the draft of my recipe prior preparing this dessert. Finally the meringue came out light and dry; exactly as I wished I arranged it with the cream and strawberries, took some pictures and we enjoyed. I don’t know what happened but I was really not satisfied with the photos and I never posted this recipe. This week I came across beautiful strawberries and I made it again …with some little changes. To give the cream a lighter and fresher taste I added a few tablespoons Greek yogurt, this made the cream smoother and even more palatable. Preheat the oven to 120°C/250 °F (convection oven 115°C/ 240°F). Beat the egg whites into a large clean fat free bowl (not plastic) to stiff peaks. While mixing on high speed add sugar, a dessertspoonful at a time. When ready, the mixture should be thick and glossy. Fold in the powdered sugar a third at a time while beating. Add lemon juice and cornflour over the mixture. Fold them gently in for example with a rubber spatula. Don’t over-mix. The mixture should now look smooth, glossy and thick, almost like a snow drift. Spread or spritz meringue shaping a 25 cm (10 inches) circle. Make sure that borders are slightly higher than center. Bake for about 1 1⁄2 hours or until the meringues sound crisp when tapped. Turn oven off and leave to cool on the tray in the oven, door half open. For the cream mix together egg, sugar and corn flour. Bring 1cup of milk almost to boil and add crushed white chocolate and vanilla, stir well until chocolate is melted. Add milk mixture to egg mixture and transfer to a saucepot. Wisk continuously and cook at medium temperature until the sauce thickened. Note: I prefer to perform this step in the microwave. 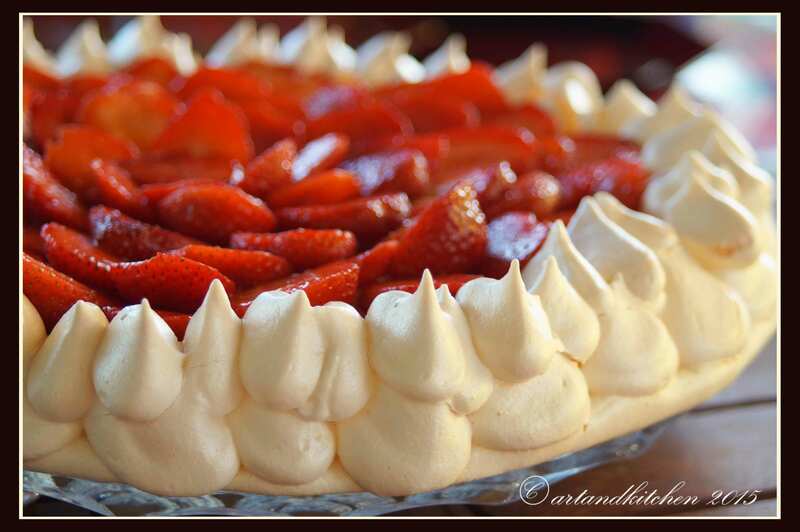 Assemble the cake just before serving: Place meringue on the serving dish, spread cream in the center, top with fruits and if you like add some whipped cream. We left the Semaphore area and went to the city again. This time we decided to visit the marked and to enjoy some food. We liked the market and we enjoyed our lunch with Asian specialties from the food stalls there, that was a great opportunity for some take away food for the next travelling day. Adelaide is really a big town, but the traffic is so well organized that we had the impression there is a lot of space in this town. That morning we decided to visit the area of the caravan park near the sea and we went to Semaphore area. The wind that surprised us during the night was still there, so no bathing day again! 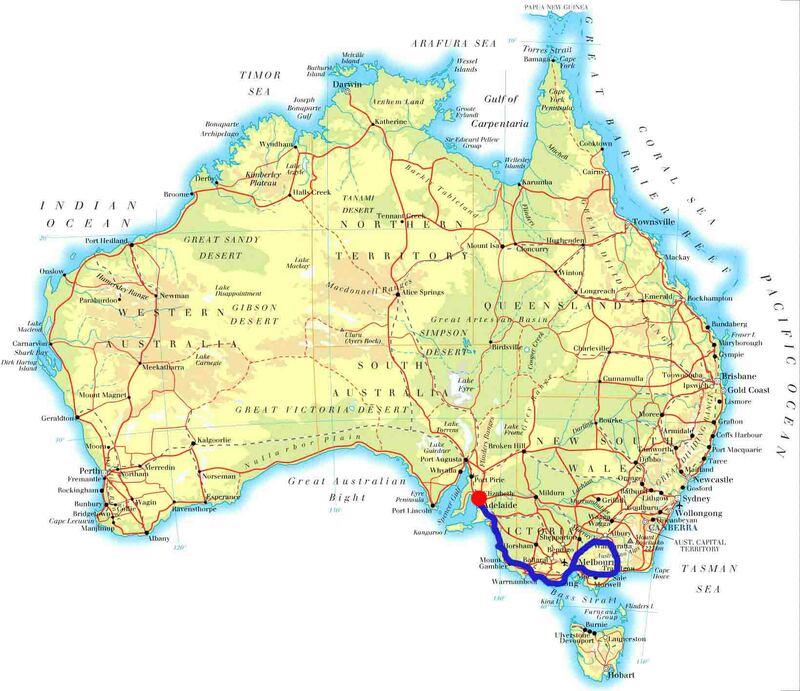 We arrived in the afternoon in Adelaide, found our place in the caravan park and went to the city. This was the really first hot day we had in Australia, and we enjoyed the heat. By public transport we arrived into the center and we enjoyed walking around and taking pictures. We crossed many road full of bicycles until we found out that a special event had just found.